On the western landing of the Mill Basin Bridge on Belt Parkway, one may notice a sizable wetland bound by the highway, Mill Basin, and Flatbush Avenue. It is home to four rare bird species: the Saltmarsh, Song, Swamp, and Savannah sparrows, resulting in its name, the Four Sparrow Marsh. With Kings Plaza shopping center to its north and the Jamaica Bay Wildlife Refuge to its south, Four Sparrow Marsh has been a contented ground between advocates of commerce and natural preservation. On the official Parks GIS map, we see the marsh tucked into an isolated corner of Mill Basin where Belt Parkway crosses this inlet as it widens into Jamaica Bay. To its west is Marine Park, which envelops Gerritsen Inlet; to its south in light green is federal parkland. This is Barren Island, which was fused to mainland Brooklyn in the 1920s, with Flatbush Avenue running atop the constructed isthmus. North of the marsh is the high-end Mill Basin neighborhood with its crop circle layout of streets containing tract mansions. Mill Basin has two branches: the larger Mill Basin that has its head at Kings Plaza mall, and the less visible East Mill Basin. On the 1920 Belcher-Hyde atlas, the site of Four Sparrow Marsh is nearly unrecognizable, lying in a maze of salt marsh islands and meandering channels that separated Barren Island from the rest of Brooklyn, seemingly the final frontier for the borough-wide street grid. Dotted lines indicate the eventual route of Flatbush Avenue, and the rerouting of Mill Creek into Mill Basin. The former Mill Island in box numbered 37 will also be fused to the mainland. The Other Islands of New York City, printed by the same publisher as my book, tells the story of land modifications around here. On the 1924 city aerial survey, we see the present shape of Mill Basin taking form. The bright colors indicate sand dumped atop marshes and channels, which includes the land where Four Sparrows Marsh lies. At the time Mill Island was the site of a lead smelting plant and an oil refinery with more industries expected to join them. At the time the basin and all of Jamaica Bay were regarded by the city as an ideal site for an international seaport. As inlets of the bay reached inland, branches of the LIRR Bay Bridge line were to connect with the inlets. The ambitious proposal included a canal for Coney Island Creek and another canal running north to Flushing Bay. Instead of Jamaica Bay, the seaport was built on the continental mainland at Newark Bay, which provided easier access to railroads and highways. Unintentionally Jamaica Bay was on its way towards becoming a wildlife preserve. On this 1951 city aerial survey we see the first tract houses lining up on Mill Island, Belt Parkway’s perfect cloverleaf interchange with Flatbush Avenue, and the runways of Floyd Bennett Field, which operated as an airport from 1930 through 1972. For most of those years it served as a naval air station. As Mill Basin was becoming residential, some factories held on into the 1960s, including a coal storage and concrete plant. When Belt Parkway was built along Jamaica Bay there was still uncertainty about the future uses of Mill Basin and a bascule drawbridge was built here in 1940 to accommodate large vessels. But as Mill Basin became residential, its traffic consisted mainly of fishing boats and yachts. It served as an irritant to drivers waiting in traffic as the bridge opened for boats. Architecturally this bridge was not distinguished at all, lacking the rounded edges and stripes of art deco and the leafy reliefs of beaux arts. For a time, the control room had a domed glass top, as seen here in 1958, but it is final two decades, I didn’t see this feature. I remember the bridge being raised perhaps a couple of times. In 2013 the city announced plans to replace the drawbridge with a fixed span to nearly twice its height. There were no objections from the property owners and marinas of Mill Basin, signaling the end to Mill Basin’s possibility of serving as a seaport. The project was part of a larger effort to replace seven bridges in total on the Belt Parkway in Brooklyn. The first lanes on the new bridge opened in Aug. 2017, with remnants of the old bridge were taken away by barge and deposited off the southern shore of Long Island as an artificial reef. This is the only bridge on Belt Parkway where the clearance was raised. The other new bridges retained 35 feet of clearance above mean high water. On the 1965 survey of the marsh, the parcel was labeled “Marginal Street Wharf or Place,” suggesting a maritime use. To its north, the grid of Mill Basin appears complete but in reality, there is an indentation between Indiana Place and 56th Drive. At the confluence of Mill Basin and East Mill Basin is Brooklyn’s most expensive mansion, on the market in 2013 for $30 million and sold five years later at a discounted $10 million. In 1968 the city proposed a marina with a shopping center and park on the site of Four Sparrow Marsh. Note the unnatural seawall shoreline and massive parking lot. If motorists wonder why Flatbush Avenue is Exit 11 on the Belt Parkway but the next exit at Rockaway Parkway is number 13, that’s because city planners may have reserved Exit 12 for this development. A missing number on the highway exit list is like a missing letter from the city’s subway alphabet– a hint of an unbuilt or removed element. Although most of Four Sparrow Marsh is parkland, a 15-acre piece on its northern side remains vacant. In 2010, The City’s Economic Development Corporation proposed two more boxy retail facilities to join the existing Kristal Auto Mall, Toys R Us, and Sea Traveler’s Marina. In compliance with regulations for new waterfront properties, public access was included with a small park at the end of the driveway. An outcry from naturalists and civic groups killed this plan. In the long run, they were proven right. The toy store went out of business and in general shopping malls are in decline as a result of online shopping. An aerial view of Sea Traveler’s Marina shows the vacant (but not parkland) portion of Four Sparrow Marsh, with Belt Parkway and Marine Park in the background. Instead the salt marsh remained in its natural state, known only to boaters and birdwatchers. Among them were Brooklyn Bird Club members Ron Bourque and his wife Jean, who gave this marsh its name. Bourque was also a past president of NYC Audubon. They also fought to preserve the grassland of Floyd Bennett Field, identifying more than a hundred bird species flying around here. In 1994 the city assigned nearly 65 acres of the marsh to the Parks Department. it was dedicated as a park on Oct. 29, 1997. 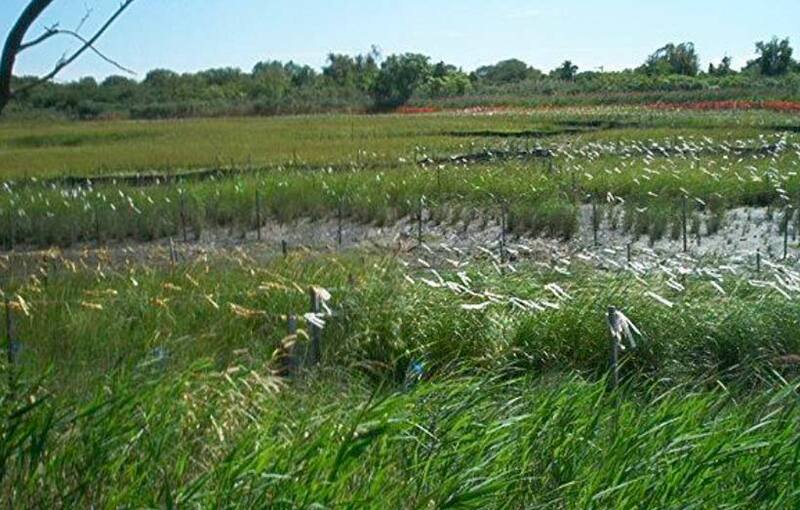 On the Parks Department page for this marsh, we see photos of strings and ribbons indicating a wetland restoration project underway. The park is designated as Forever Wild, never again to face threat of development. There are 51 such sites across the city, managed by the Parks Department’s Natural Resources Group. This was excellent. Thank you. I live right nearby in the Marine Park neighborhood and I always enjoy reading about the history of the area. The Jamaica Bay Riding Academy is Exit 12 on the Belt Parkway. Last time I checked, the one-sided exit to the riding academy did not have a number. But you can confirm this with Steve Anderson of NYC Roads. Excellent article, marred by one wrong word: in the second paragraph, …contented ground should be contested ground.